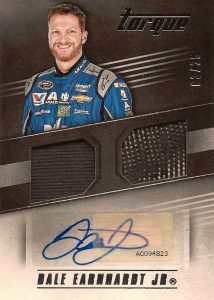 One of the earliest options under their new racing card line, 2016 Panini Torque NASCAR Racing brings collectors back to the track. This comes after a hobby hiatus for the sport following the demise of Press Pass, which previously held the license. Each hobby box promises three autographs and two relic cards. 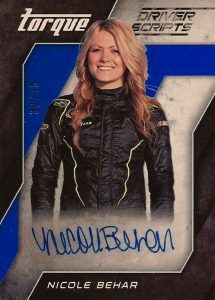 2016 Panini Torque NASCAR Racing starts off strong with only hard-signed autograph content. 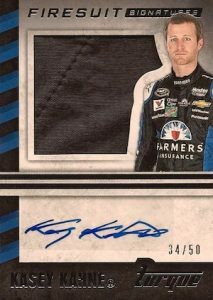 This includes the Panini-standout Silhouette Signatures line, numbered to 499 or less, which is familiar to many collectors from other sports. 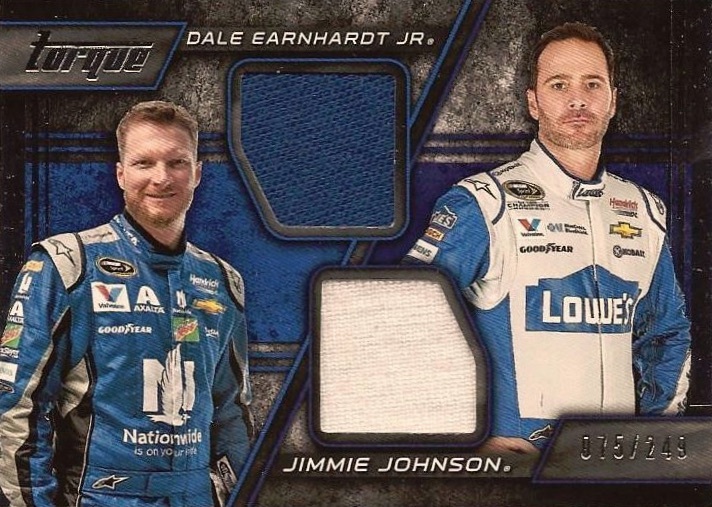 Pairing a signature and relic piece, Firesuit and Sheet Metal are among the Silhouette memorabilia options. Parallels include Blue (#/99 or less), Red (#/49 or less), Green (#/25 or less), and Purple (#/10 or less). 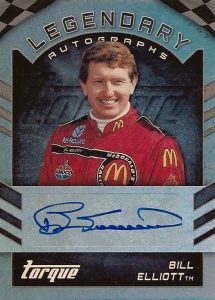 There are also Combo Material Signatures with dual relics along with Jumbo Tire Signatures and Jumbo Patch Signatures. 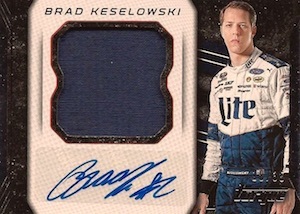 Just like all the auto relics, Pairings Materials features race-used materials for teammates. 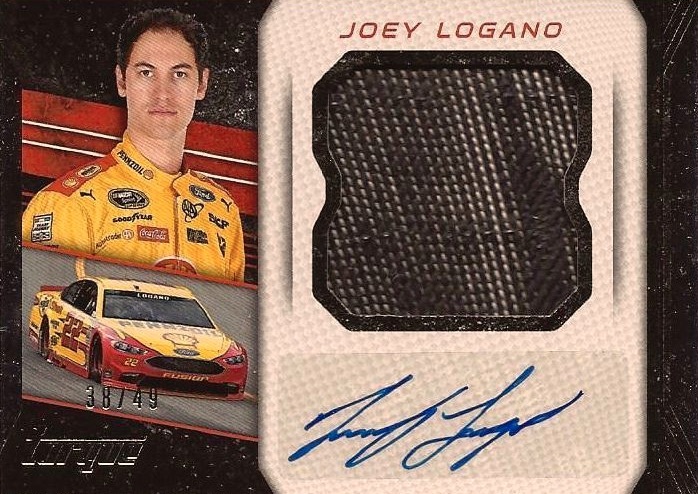 Beyond the hits, 2016 Panini Torque NASCAR Racing inserts come in several forms. Transitioning over from a standalone brand for basketball and football, Clear Vision inserts showcase acetate stock and also include Championship Vision with a die-cut trophy, Superstar Vision and Winning Vision cards. Race Kings showcase the Diamond Kings look while Nicknames focuses on the monikers for top drivers. Other choices include Painted to Perfection and Pole Position. 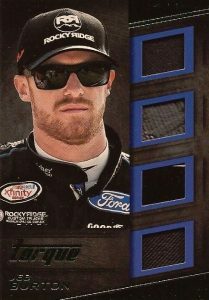 UPDATE (10/20): Based on live card images posted by Panini, it appears that there is little or no on-card content in 2016 Panini Torque NASCAR. It was previously announced that Certified Racing was moving from on-card to sticker signatures but Torque was not referenced as being part of the change. PARALLEL CARDS: Gold, Blue #/125, Red #/99, Artist Proof #/50, Purple #/25, Holo Silver #/10, Holo Gold #/5, Blackout 1/1, Test Proof Plates 1/1, Printing Plates 1/1. 9 cards. *Card #4 found only in Green, Red parallels. PARALLEL CARDS: Blue #/75 or less, Red #/40 or less, Green #/25 or less, Purple #/10 or less. PARALLEL CARDS: Blue #/99 or less, Red #/49 (*Card #11 - #/15), Green #/25 (*Card #11 - #/10), Purple #/10. PARALLEL CARDS: Blue #/99, Green #/25, Red #/49, Purple #/10. PARALLEL CARDS: Blue #/99 or less, Red #/49 or less, Green #/25 or less, Checkerboard #/10 (*Cards #33, 34 - #/5). PARALLEL CARDS: Blue #/99 or less, Red #/50 or less, Green #/25 or less, Checkerboard #/10 or less. PARALLEL CARDS: Blue #/99 (*No card #3), Red #/49, Green #/25, Purple #/10. PARALLEL CARDS: Blue #/99, Red #/49, Green #/25, Purple #/10 (*No card #7). PARALLEL CARDS: Blue #/99, Red #/49, Green #/25, Purple #/10. PARALLEL CARDS (Card #6 and 19): Blue #/25, Red #/10, Green #/5 or #/3. PARALLEL CARDS: Blue #/75 or less, Red #/40 or less, Green #/25 or less (*No card #12), Purple #/10 or less (*No card #12). I am very disappointed that they are going high-end only, with no basic set like Hoops or Score. They are falling into the same trap that killed Fleer and Press Pass; the high end only stuff that most collectors can’t afford- or refuse to buy on principal. Billy Kingsley � I get what you are saying, but Prizm is more low-end than high-end. Pricepoint wise that’s true, but all the photos in that set have been altered to fit the printing technology. Aden Taylor � Blasters are going to be around $20. Aden Taylor � It’s because there is a guaranteed hit in every blaster. 1 case and 0 hard signed autos. At a higher price point, I expected better quality hits over what Prism had to offer. I consider myself a race fan and didnt know who 1/2 of the autos were from. The product was flooded with Truck and Xfinity autos which are basically like having minor league or “D” league stars in a major league product. 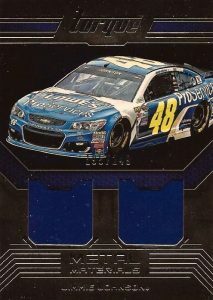 I was initially a fan of Panini taking over the licencing for NASCAR however now miss Press Pass. At least with Press pass you didn’t get fluff and junk on the hits. 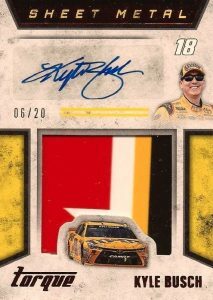 I understand that its $20 due to a guaranteed hit,but only 8 cards?I bought a blaster and all i got were 6 basic cards,one of them gold.A race kings,and then the hit,which was a dual race used material from Ryan Newman. What i dont understand is why they couldn’t just make torque like prizm.With 24 cards in a blaster,one guaranteed hit.